Used indoors or out, the Cast Aluminum Stair Nosing provides crucial anti-slip safety properties in poured concrete stairways. Ideal for use in new construction or in renovated stairs, the nosing offers maximum durability in some of the most corrosive environments. Meet ADA requirements. Treads are installed flush all around the step, and standard measurements are from top of nosing. Choose from standard depths of 3", 4", or 6"
Custom lengths available to � 1/16". Maximum available is 8'6"
DO you have any dealer/rep in Honolulu, Hawaii? Used in new construction or renovation projects, Cast Aluminum Stair Nosing can provide critical anti-slip properties on stairways in some of the harshest environments. I love these step edges they are easy to install, they are beefy and are definitely an upgrade of what I have. when I installed them the only thing I had to do was trim them to fit the step casting and we were ready to go. I will definitely buy more of these when I need to replace the others. Thank you for your review and very much appreciate the detailed explanation. The product is definitely "beefy" and can withstand a tremendous amount of tough traffic. If you ever have any further questions, please don't hesitate to give us a call. Light weight and easy to trim and install. The pre fabricated imbeds in the nosing saves time in the drilling and install of anchors. 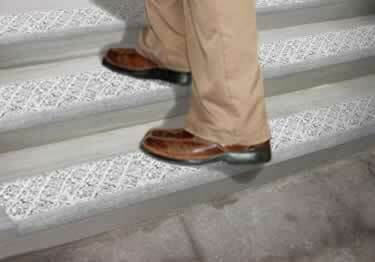 Designed to fit over existing steps or walkway, providing a brand new surface with durable anti-slip performance.